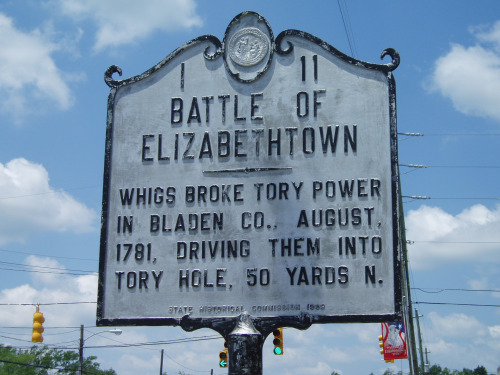 On August 27, 1781, the Revolutionary War Battle of Elizabethtown was fought. Two weeks earlier, Loyalist forces under Colonel John Slingsby captured several Whig—that is Patriot—supporters in what’s now Fayetteville. Slingsby brought his prisoners to Elizabethtown, in Bladen County. The day before the battle, a local resident named Sallie Salter entered the Tory camp to sell eggs. Unbeknownst to them, she was a Patriot spy. She reported to Colonels Thomas Robeson, Jr., and Thomas Brown, commanders of a band of Bladen County militiamen that had withdrawn to Duplin County. Her information led to a decision to attack Slingsby. This was a considerable gamble, as the Patriot command numbered between 60 and 70 men, while Slingsby’s forces totaled between 300 and 400. After a night march, the militiamen launched a surprise attack on Slingsby’s camp. The resulting confusion was amplified by the successful efforts of the Whigs to make the Tories think that there were far more Patriots present than there actually were. With Slingsby dead, the Tories retreated to a ravine, afterwards called “Tory Hole.” There they were fired upon until they surrendered. The Patriot victory permanently weakened Tory power in the Cape Fear region.